Max load 25kg per pair of bars. Gap between bar pairs - 13 Bar Rack: 113mm, 16 Bar Rack: 85mm, 20 Bar Rack: 65mm, 25 Bar Rack: 50mm. Special Heavy Duty Nylon Castors giving a maximum payload of 400kg (25kg / pair of bars). Fully welded construction which is coated for a durable quality finish. 1mm thick replaceable Poly-Prop plastic sleeves and end bungs protect the work piece against accidents and allows easy cleaning of bars. 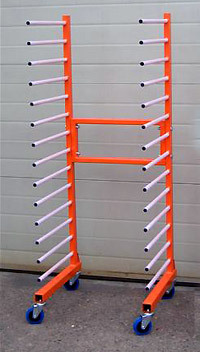 Unique nesting feature allows all different size racks to nest together when not in use. Custom design to suit customers needs. Need longer bars? Wider upright centres? More uprights? Get in touch for a price. Max distance between bars: 1430mm. Min distance between bars: 300mm. 4 off 150mm dia swivel castors. 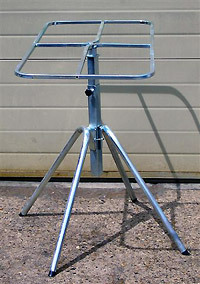 The new budget rack is designed to be low cost and versatile. The central "2 way" seperator frame gives two oprions of sizes. 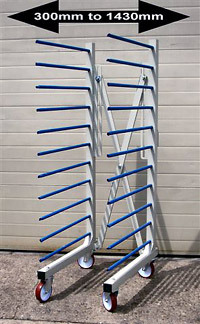 The rack is supplied as a simple self assembly product. Gap between bar pairs 85mm. Bars can be 290mm or 600mm apart, depending on preference. 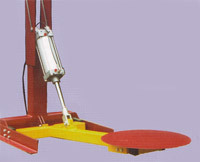 Supplied with standard slide on Poly-Prop sleeves and end bungs. Swivel castors for easy movement. Unique central "2 way" separator. Adjustable in height, 690mm to 840mm. Super smooth bearings for easy rotation. Spin by feet keeping hands free and clean. 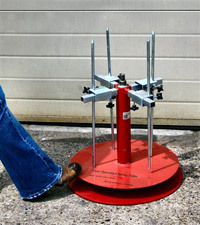 Adjustable in height, 650mm to 1000mm. Distance between opposing prongs 120mm to 680mm. Design allows good air flow with no chance of paint 'bounce back'. 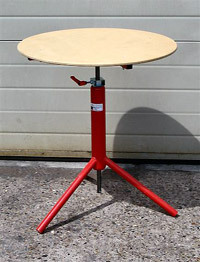 Adjustable in height, 600mm to 1000mm. For heavy and awkward items. Raise and lower to an position. Goes flush with the floor. 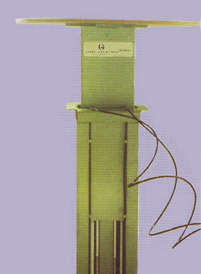 Pneumatic design for safe operation. Raise and lower to any position.